There are plenty of vehicle manufacturers at this year's Consumer Electronics Show, and they all have roughly the same message - it is time to shake up the industry. No-one took that message more seriously than Volkswagen, a company mired in scandal over how it measured its emissions, and, when he took the stage at CES, chief executive Dr Herbert Diess was keen to apologise once again. He said a "new and better Volkswagen" was being built that would concentrate on creating a future without noise, congestion, emissions or accidents. He wanted to build cars that "make people happy", which is perhaps unsurprising given recent events. 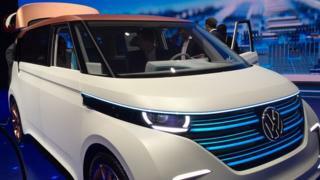 Key to that would be electric, connected vehicles, Dr Diess said, showing off a concept van that harked back to the glory days of VW's iconic Camper, which he described as "the embodiment of peace, hope and happiness". The BUDD-e four-wheel drive electric minivan could go into production within the next decade, Dr Diess said. The Verge described it as a "groovy, far-out vision of the future". But CNet asked who would want a car that could "open the front door of your house, spy on your kids and potentially accept packages". Car manufacturers have been exhibiting at CES since 2007 - but, this year, there seems to be a fresh determination to merge automotive and technology. The event launching the much-hyped car from mysterious Chinese-backed Faraday Future was one of CES's most anticipated and best attended. In a hard-to-find car park off the Las Vegas strip, the Batmobile-like vehicle was unveiled in a manner previously reserved for shiny gadgets. "We want to be a technology company rather than an automotive company," senior vice-president Nick Sampson told the audience. "Apple transformed the phone industry nine years ago, and that is what we at Faraday Future are seeking to do - to redefine the world of mobility." That is a lofty ambition, and many doubt whether the company can achieve it. But it has had rapid growth since it launched 18 months ago. It already employs 750 people and intends to add 4,500 more when it builds its first manufacturing plant in Las Vegas later this year. But it was strange that, in a launch claiming to be about redefining mobility, the car remained static throughout. In his keynote speech at CES, Ford chief executive Mark Fields said megacities with populations of 10 million or more, and a growing global middle class, were also contributing to the need to drastically rethink mobility "to make people's lives better". There were some 800 million parking spaces in the US - but, in cities such as San Francisco, only 14% of people searching for a spot found one straight away. And those cars driving around slowly looking for parking spaces accounted for 30% of urban congestion. But Ford is not being entirely altruistic - it is keen to grab a share of the $5.4 trillion transportation service industry, with its own car-sharing and car-rental schemes. Ford was the first automotive company to take to the CES stage, in 2007, when it joined Microsoft for a keynote. This year, there was speculation it would announce a tie-up with Google. But that did not happen - perhaps it plans to reverse roles and invite Google to the Detroit motor show later this month, where some experts predict it will announce the partnership. Ford did, however, announce a tie-up with technology company Amazon, using its voice-activated speaker Echo to enhance communication between homes and cars - allowing motorists to open their garage before they arrive home, or turn the lights off from the car. It also announced a novel partnership with the United Nations to find a way for cars and drones to communicate with each other, initially to help improve the response to natural disasters. And it revealed it would be expanding its fleet of fully autonomous cars to 30, with a new licence to test them in California - which, by coincidence, is the home of Google. During its press launch, Toyota concentrated on its $1bn investment the Toyota Research Institute. Led by ex-Darpa project manager Dr Gill Pratt, the artificial intelligence research lab will have close ties with Stanford and MIT and Facebook's head of AI Yann LeCun as an adviser. It will concentrate on teaching autonomous vehicles to respond to unexpected events, such as cargo falling out of a van travelling in front. Image caption Volkswagen's Dr Diess said he wanted to build cars that "make people happy"
John Curran, an analyst with consultancy company Accenture, said: "A consensus is forming among auto experts that driverless technology will reach widespread adoption by 2030. For these vehicles, car companies will focus on driver security and safety."